Taking care of a pool can feel like a full time job. Even the smallest pools require work and knowhow to properly maintain a healthy swimming environment. Pools might seem simple at face value; most people think that pool maintenance is nothing but skimming leaves out of the pool and maybe checking the water levels every so often. If you own a pool, or if you are thoroughly researching before installing a pool, you know better. Pools can be involved projects, with particular maintenance techniques and sometimes intricate pump systems. To learn all the basics of properly maintaining your pool and all of its parts, consider taking classes. Hersey Pool Service in Jacksonville, Florida offers a variety of “Do It Yourself” Classes to teach you all about your pool, how it works, and how to properly take care of it. What sort of things can I learn from “Do It Yourself” Classes? There’s a lot involved in pool care and maintenance. “Do It Yourself” classes are a great place to start to learn the basics. From the outside tiles to the inner workings of your pump system, keeping your pool clean is an absolute must. While cleaning might sound like a simple task, there are some parts of your pump system that are rather intricate and require some knowledge, especially when taking apart and putting back together. Some pool cleaning chores are pretty involved, so knowing what you are doing and the best tools to use is extremely beneficial. When something breaks, you want to know how to fix it, plain and simple. While major malfunctions or breaks might require the finesse of a professional, there are quite a few repairs you could actually do on your own if you had the right training. For pools, a great portion of issues will revolve around leak detection and repair to stop the leak. 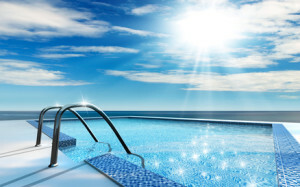 The professionals at Hersey Pool Service can teach you some basic repairs for common problems. Maintaining your pool is your number one priority to keep a healthy swimming area. Depending on what kind of pool you have, this means knowledge about chemicals and how they work, pump systems, and the sometimes intricate patterns of tubes and filters. “Do It Yourself” classes are the perfect place to learn all of the basics you need to properly maintain your pool, including accumulating some much needed knowledge of pool chemicals and how they work. Pool chemicals especially can be dangerous to work with, and too much or too little can be dangerous not just for your pool and equipment, but for the people swimming in your pool. For more information about “Do It Yourself” classes that are being offered, call Hersey Pool Service is Jacksonville, Florida. Their pool professionals can help you determine which classes will be best for you and your pool. Pools are a lot of work, but with the right training it can be a lot easier.